For all of you who suffered through the negativity of my last blog entry, I am proud to announce that my slump has officially ended! That's right, this past week I finally caught some fish... And I wasn't the only person to catch fish this week either--my Dad made some amazing catches this week. He has fished HARD this entire winter (much harder than I have), and a lot of times the fishing has not been easy. As I mentioned in my last entry; eventually, hard work, dedication, and time on the water will pay off. The proof was in the pudding for my Dad this week. But for now... Let's talk about the FISH!!! This past Wednesday was the day I broke out of my slump. Dad and I had been talking about hitting a few spots on the river for a couple of days, but it just hadn't happened yet. I had some chores to do around the house in the morning and Dad had to work, so we gave the mid-day sun a few hours to warm things up a little bit before we tried our luck Wednesday afternoon. About 1:30 or 2 PM we finally began fishing. We struck out at the first two spots we fished, minus a couple of carp... but the third spot turned out to be just the ticket. About midway through the retrieve of my second cast at the new spot, I felt my lure stop---I set the hook and I was hooked up. My first thought was that I had snagged a carp, but soon I felt headshakes and saw my line moving erratically and reversing directions as if it were attached to the head of a fish. At this moment, I remember feeling a little bit of hope rise up in my belly. 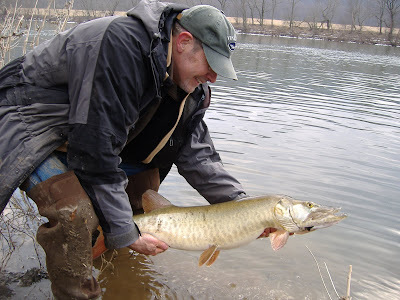 Within a few moments I saw a nice-sized musky come to the surface. My lure was in his mouth, and he was shaking his head violently, trying to get rid of it... Now I was EXCITED! I fought the fish for a couple of minutes before my Dad slid down over the steep bank to the waters edge. I passed my boga grip down to him as I tried to lead the fish over toward the bank. A few moments later Dad had him on the boga and passed him up to me. We were both ecstatic. 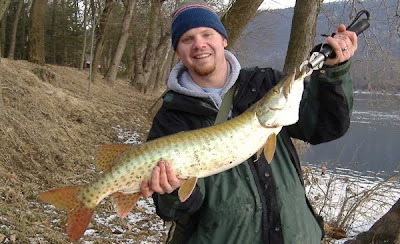 I don't catch a lot of muskies, so every one I get is a special treat. We took some pictures, weighed him (at 9 lbs. ), and taped him out at 32 1/2 inches. Not huge, but respectable... and exactly what I needed to get out of my slump, lol! After taking some time to revive my fish and watching it swim away happily, I was freezing cold but on cloud nine. Dad and I walked back over to the spot where I had hooked my fish and I stood with my hands in my pockets trying to warm them up, while Dad said to me, "Okay... now I'm going to catch a bigger one." We both chuckled as he made a couple of casts back into the same area where I had hooked my fish. Near the end of his second retrieve, I watched as his line stopped and he set the hook into a large fish. Within seconds a big musky came to the surface, made a few headshakes and then spit the lure right back at us. Our hearts both sank, but we laughed in disbelief as Dad's prediction had almost come true. A few moments later, I watched again in disbelief as Dad made a cast back into the same hole and hooked the same large musky again! Luckily this time he stayed on the hook. It was an awesome battle. The fish was very strong and thick bodied. It fought hard, and took a few minutes to bring him to the shoreline where I was waiting with my boga. It was a bit of a struggle to get the fish on the boga actually, but it became an even bigger struggle for me to get the fish back up over the ice and mud-covered, slippery bank. We both slipped and fell down in the mud a couple times during the process, and I filled up both of my knee-high boots with icey-cold water, lol. After some picture taking, weighing, and measuring the fish; I watched as Dad walked her down to the water and revived her for a while before she regained her strength and swam away strongly. His fish measured 37 inches and weighed 15 lbs. As you will see from the pictures, she was a very thick-bodied fish--very healthy, and probably full of eggs for the upcoming spawn. As I sit here typing this blog entry, we are getting hammered with snow in central PA. A strong nor'easter blew into our area this past evening, and the winds have been blowing hard and the the snow has been falling ever since. However, right before the snow began falling this evening, I received a curious text message from my Dad. I could tell that it was typed quickly and with cold fingers, but from what I could decipher it said, "Just caught 22 inch smallie." 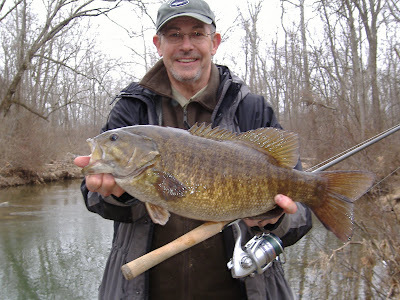 Instantly, I got a big smile on my face as I new Dad had just caught his new personal best smallmouth. 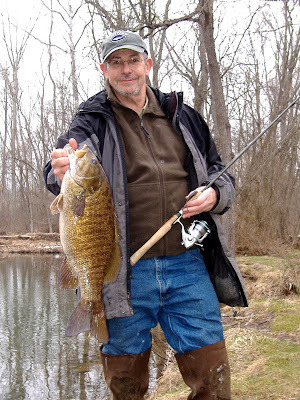 I quickly gave him a call, and before long we met up to take a few pictures of the beast, which is now the largest smallmouth bass I have ever seen. I will post some of the pics here for you, but honestly they don't do it justice. The bass taped out at 22 1/4 inches, with a 16 inch girth, and weighed in at 6 1/2 pounds. 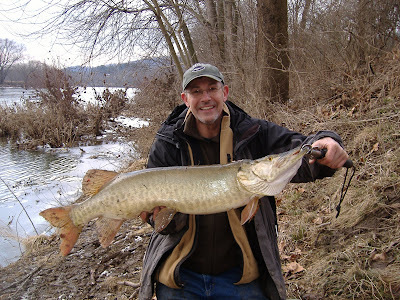 It looked like a giant, great lakes' fish from Erie or Ontario instead of a central PA river bass. All I can say is congrats to my Dad. I can't be happier for him. He has had a quite a week! Hopefully this report wasn't too long winded for you. But I do realize that if you are in central PA like myself, you probably won't mind having some extra reading material to help pass the time during the next couple of snow-filled days. If you are out and about, please be careful on the roads and if you find yourself getting depressed b/c of this nasty weather... keep on looking forward to warmer days ahead. Before long there will be clear skies and some more time on the water. As always, thanks for reading!